People live their lives convinced that there are two parts to the day; day and night. For a group of teenagers belonging to a group known as S.E.E.S there is a third part, known as the “Dark Hour”. People caught in this bizarre twilight time are said to experience “Apathy Syndrome” (becoming almost lifeless). It is also stated that disasters befalling Japan’s citizens during the day are in part due to activities taking place during this “Dark Hour”. The members of S.E.E.S go to a mystical tower filled with demons known as Tartarus during the “Dark Hour” in order to protect the citizens of Japan. 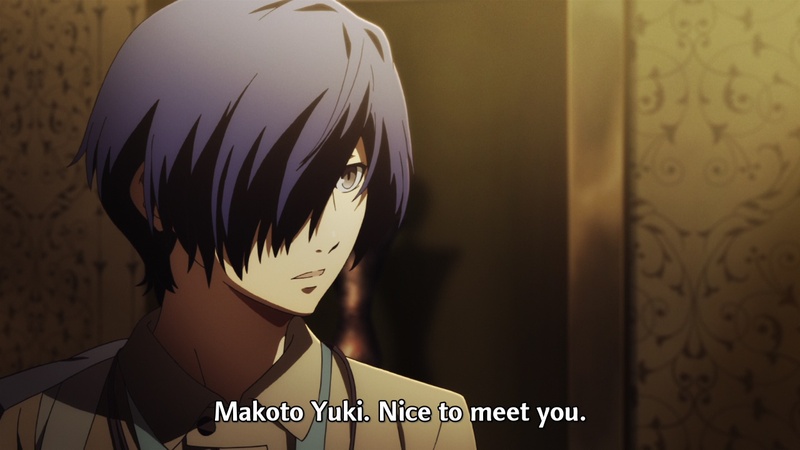 When Makoto shows up at the dormitories of his new school he is cold and anti-social. When he is given the chance to fight for S.E.E.S, will he take this opportunity, and regain some of the humanity he seems to have lost with the help of his newfound friends? Will his ability to use multiple Persona’s help S.E.E.S defeat the ever growing darkness? 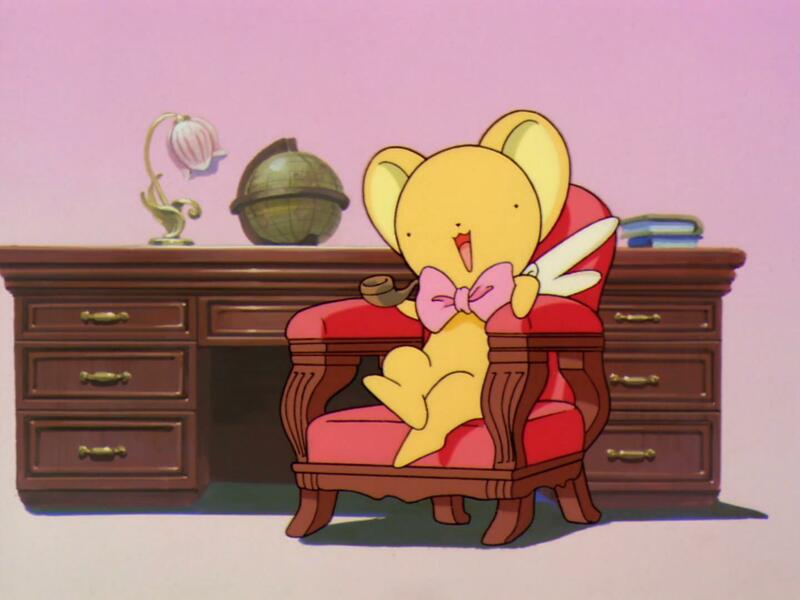 There’s an old wive’s tale among anime fans wherein any anime based off of a video game is usually garbage. This doesn’t always hold true, but more often than naught we anime fans realize we should have listened to those old wives. The first Persona 3 movie is a mediocre attempt at bringing the beloved franchise to film. I will admit that I have never played Persona 3. At the time of writing this the only Persona game I’ve ever played is Devil Summoner for the DS. I’m sure some die-hard Persona fans will say that that doesn’t count. 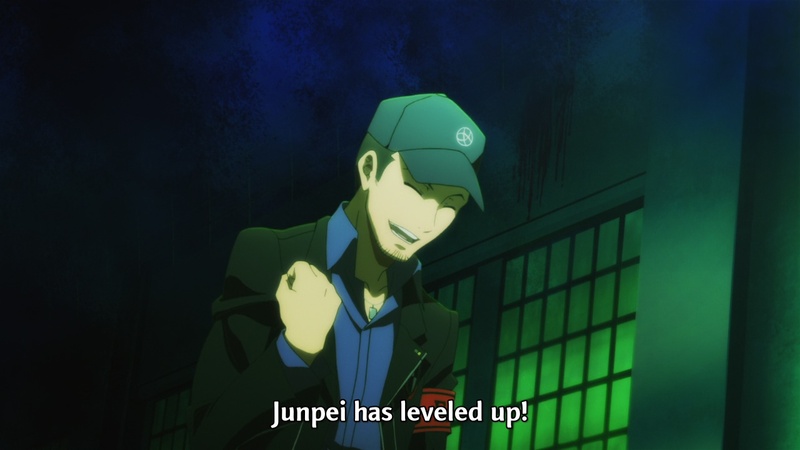 I started Persona 3 FES sometime ago, and having read some of the manga I am familiar with the characters. Thank goodness for that because without that knowledge I could have been completely lost in this movie. Let’s start off with the good. The movie for the most part is visually stunning. All the colors are bright and vivid when they need to be and very rarely does anyone go off model. The designs of the side or throwaway characters are all varied and I appreciated the attention to detail in the backgrounds. The fight sequences are beautifully crafted but nothing spectacular. There are some explosions, some magic attacks, but it’s not going to be anything the blows your mind. There is a sequence where the main character summons his Persona the first time and I was really impressed by the scene. The initial parts of the movie are fascinating and eerie, similar to the game’s opening sequence. It even plays “Burn My Dread” after an intro from Igor (voiced by the game’s voice actor) and Elizabeth so fans of the game will be thrilled with all the references. Almost everything that follows this is a high speed train wreck. The main character Mikoto is about as interesting as sheet rock. I understand that all Persona hero’s are meant to be blank slates that the player gives life to, but in a movie this concept simply doesn’t work. Mikoto speaks in monotone most of the time, fights for S.E.E.S without question and is an all around bore. The movie’s choice to play him this way tangentially damages all the other characters. All of them try to get to know him, open up to him, or otherwise play off of him in a way that seems forced and scripted. It’s difficult for anyone to be interesting when he/she are interacting with a wall. This, added to the fact that every one of the main characters are as tropey as they come, make every interaction look a tad bit unnatural. 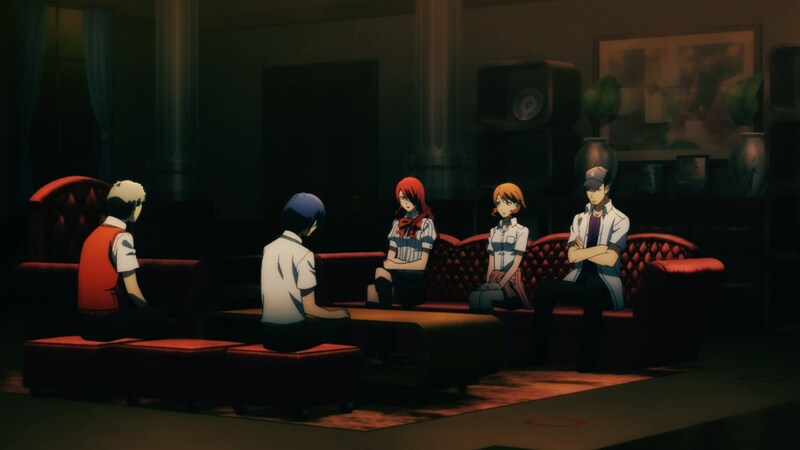 What we have to work with is girl-next-door Yukari, comic relief bro-fist Junpei, tough guy Akihiko, Ojou-sama Mitsuru, thug with a heart of gold Shinjirou, and so nice it’s sickening Fuumi. None of these characters do anything outside of their given tropes so the whole experienced feels landlocked in terms of character development. Our steadfast team of teenagers! Two of my “favorite” (note the sarcasm) moments involve his interactions with heroines Yukari and Fuumi. 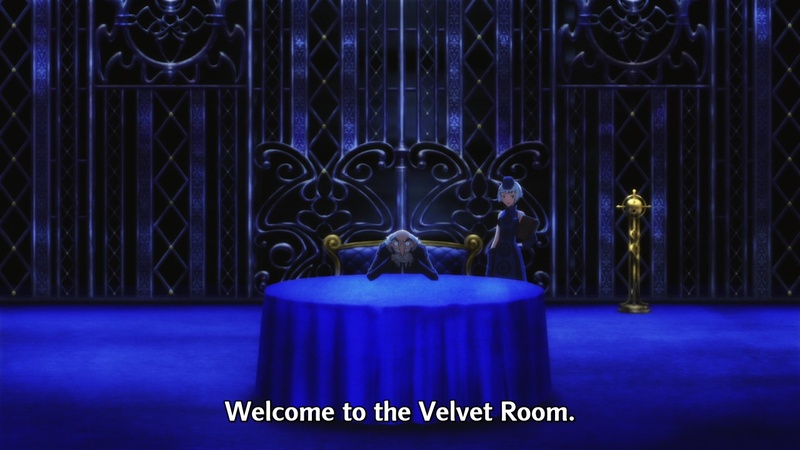 In the beginning sequence Mikoto summons his first Persona and overdoes it. 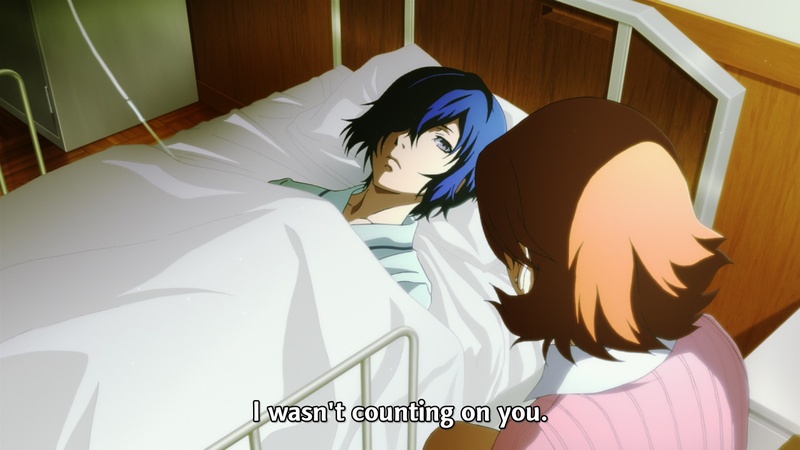 He ends up in the hospital where Yukari talks to him like they’ve just been through war together. She reveals something personal about herself and feels guilty for hiding it from Mikoto. This sequence is prefaced by them having known each other for a solid day or so. What on earth was the viewer supposed to feel? The money winner line occurs when Mikoto states that he wasn’t counting on Yukari to actual protect him. Good going man…I’m sure ALL the ladies want you now. 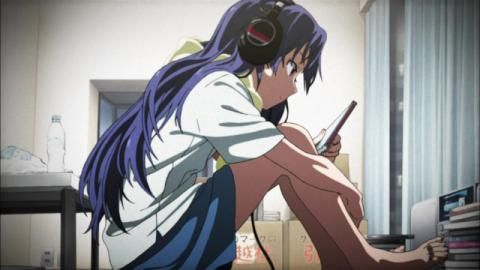 With Fuumi, Mikoto interacts with her twice to help her pick up her books and later on he tells an ungrateful friend of hers that Fuumi thinks of this girl as a “good friend”. This girl is moved to tears after his dramatic deadpan performance and later on Mikoto sees Fuumi as one of his friends with his newfound, supposedly deep understanding of friendship. The plot suffers just as much as the characters in terms of feeling stilted. The basic idea behind the first movie is that a the S.E.E.S team goes into Tartarus and fights evil creatures in an attempt to permanently thwart the “Dark Hour”. You start out by seeing Mikoto arrive at the dorm of his new school, craziness ensues and he summons Orpheus and joins the team. The rest of the movie is other people joining up and random sequences where the gang fights evil creatures in Tartarus. 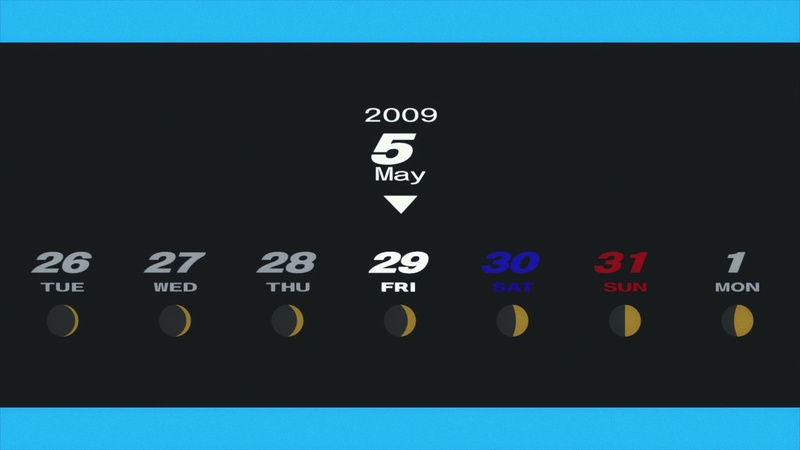 Instead of naturally showing time progression, the movie chooses to rip the calendar sequence straight from the game. Due to this, we the viewer get the experience where every event and interaction seems haphazardly glued together. If you’ve played the game it may all make more sense, but if you are coming in as a newcomer the movie does nothing to really help you understand what is going on. Overall Persona 3 is a boring, stilted movie that draws too heavily on its game source. It offers very little to anybody interested in the franchise outside of pretty visuals. If you are a huge fan of the game you may enjoy this more than I did. If you are unfamiliar with this whole thing, you are better off watching somebody play the game on youtube.